Paper craft punches can provide a quick and easy way to make handmade cards, or something a challenge as you take on punch art projects. "I use paper shapers so often creating hand made greeting cards"
Scroll to the end of the page for some basic instructions about how to make this butterfly banner as a bonus technique. 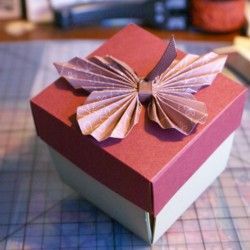 Paper Craft Punches to the Rescue! Have you ever needed to make a number of cards for a group of people and have it all done in a hurry? For a hand made greeting card to have an impact and be appreciated it does not always have to be loaded with techniques and clever ideas. Sometimes all you need is some eye catching colour combinations and a few paper shaping tools. To demonstrate how easy they are to use, here's a cute video from Stampin' Up! showing how to use the Fox Builder Punch. I once wanted to thank a group of eleven special people and had only a short time to make them a card each in a short period of time. There was a deadline when this group would be together, so I was wondering how I could make eleven cards quickly and easily? There are many ways to do speedy work, but in this occasion it was punches to the rescue. First I picked a smaller sized card blank to work with. The little birdie card pictured above measures only about 2" x 1 1/2" (5cms x 3cms). I had just bought the scalloped lace punch as well and was so impressed with it, I wanted to include an embellishment made with it too. I picked my colours of cardstock and ink, stamped my oval image and punched out the oval shapes, then made some thin strips of lace with my border punch. I inked the edges of the punched lace and the oval as well. After playing around with the space I had on my card front, the little bird stamp fit in on the bottom left for me and I liked the position I found for the lace border and the punched oval. I used double sided tape for the punched lace border and some Stampin' Dimensionals for the oval embellishment. The inside of the card was just big enough for a cute sentiment stamp I had in mind with room to spare for some heartfelt words of thanks. It didn't take long at all to make eleven of these once I had my assembly line of card pieces sorted out. It is quicker to make as many card elements as you need all at once. 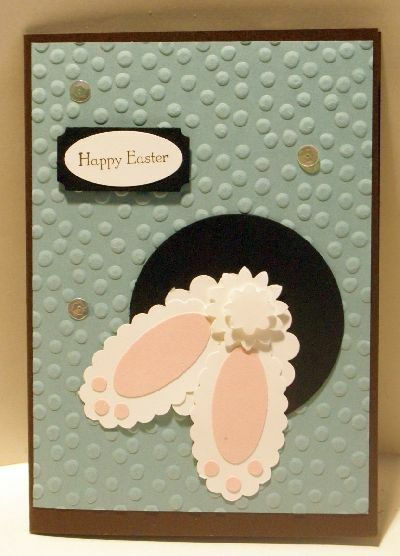 In other words, if you are making 11 cards, stamp 11 images and cut them out, punch 11 strips of paper lace, etc, and pile them up in the order you need to assemble the cards. Then you will find all the cards go together quite quickly and easily. 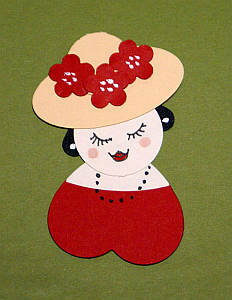 So next time you need a whole lot of hand made greeting cards in a hurry, do consider using your paper craft punches. PS: You can make the butterfly banner at the top of the page by punching out five larger butterflies with the paper shaper from Stampin' Up! and folding them in half. Glue the tips of their wings together to make your banner. 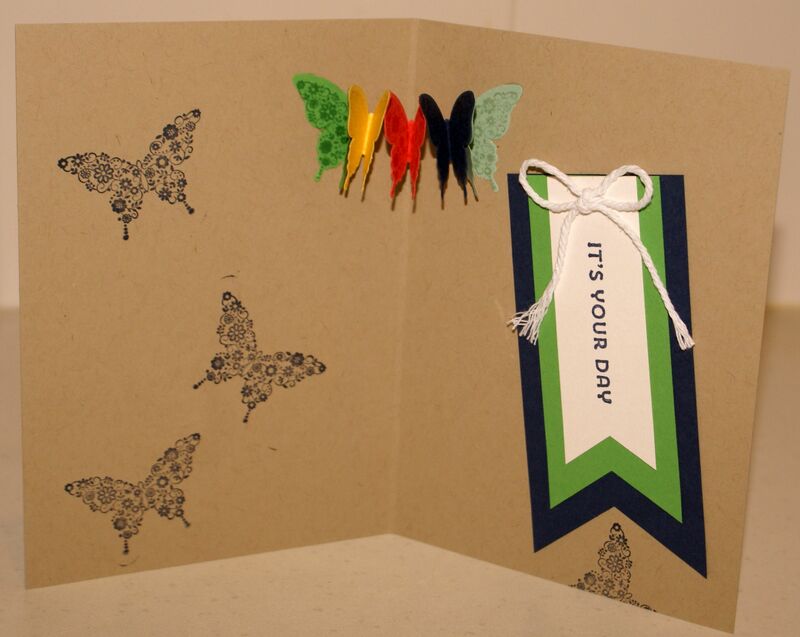 Adhere one butterfly to your card, close up the banner and apply glue to the top butterfly. Close your card on it and wait till the glue holds. When you open your card The sentiment banner is of course made with the Stampin' Up! Banner Triple punch. Check the catalogue in the right hand column to see if it is still available. 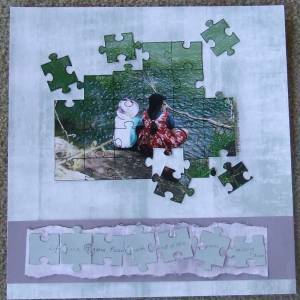 And if you make something with your punches, I challenge you to add a story and a photo of your project here! Do You Have A Favourite Handmade Card to Share? 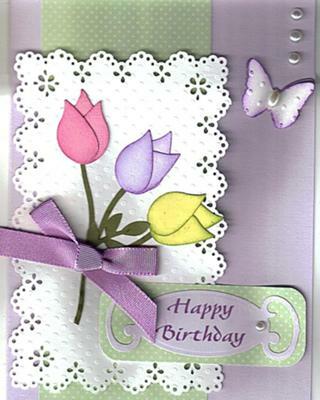 Do you make greeting cards? Please do share it with me. Entering your story about the technique you used to make your amazing card, why you like it or even letting us know the reason why you made your card is easy to do. Just type! Do you have a picture of your card to add? Great! Click the button and find it on your computer. Then select it.